If you are looking for a tech filled reel with the performance the Penn Clash is for you. It is super smooth, durable and light enough to fish all day! Available in models 2000 through 8000 there is a Penn Clash size for all styles of saltwater fishing. The 2000, 2500 and 3000 are great for casting light tackle lures with 10-15 pound braid. The 4000 and 5000 are perfect for any medium tackle approach. The 6000 and 8000 are the go to for large game like tarpon, jacks and trophy striped bass. The Penn Clash series is divided into two groups. The 2000-5000 have strong and lightweight ridged "Techno-Balanced™ RR30" carbon rotor and aluminum main gears. The 6000 and 8000 reels have aluminum rotors and fully machined brass gears. While it adds weight they offer the ultimate strength for long term durability battling big fish with heavy drag. All Clash reels have a strong tubular aluminum bail for long life and a rotor break to prevent unwanted bail trip when casting. 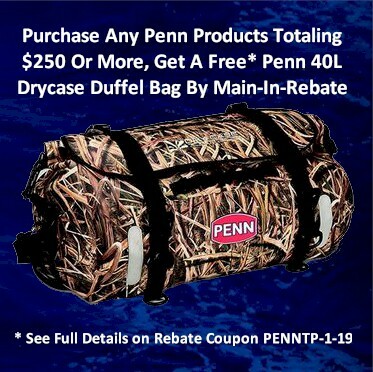 Want a FREE Penn 40L Drycase Duffle Bag?